Balloon Launch 2012 – Happy Birthday Caleb! Our Caleb would be nine on May 21, 2012. It is a special task to celebrate the ever-too-short life of a child who has passed away long before his parents or brothers. Long before his grandparents, aunts, uncles and cousins. Long before his great-grandparents. It’s just not natural. It’s just not right. It’s broken – like the world we live in. Fallen. There are so many things that aren’t right in this world. Yet God has promised to walk with us through every storm, every tragedy, and every hardship. I have lived in the faithfulness and love of this promise for nine years. So we celebrate – what else can we do with all the love in our hearts for our Caleb? I am grateful for the short time we had. I am thankful that his soul touched ours, even for such a short time. I am confident of where he lives now – at home in heaven. We talk about Caleb often in our family – he is one of us, and we openly talk about him – honest conversations. We talk about heaven, about boys that can’t wait to wrestle their brother (I tell them to get ready because he may have had a few tips from Samson! ), about a mommy that longs to feel her son’s arms around her – picking her up and swinging her around in the biggest hug she’s ever known, about a daddy who will one day look his middle son in the eyes and know that it’s finally OK. 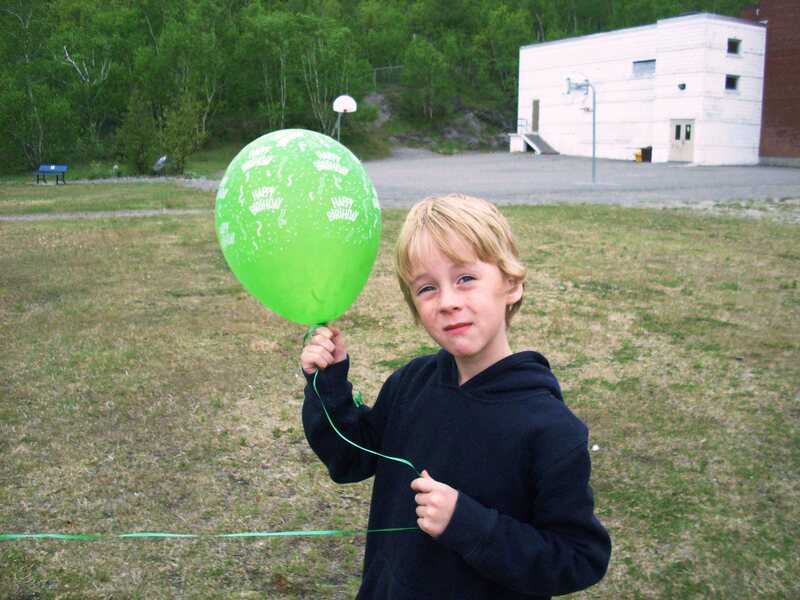 I chose a green balloon this year, and we went to Minnow Lake near our home. It was a very windy day and we knew the balloon would just shoot out of sight. I couldn’t get a picture fast enough! We all grab hold of the string and kiss the balloon. We sing Happy Birthday to Caleb. We release our gift to him – celebrating his day with him the only way we know how. We always see who can keep the balloon in sight for the longest time – Josh always wins. We stand for a few minutes – each of us processing in our ways. We do our best to love each other. Somehow Caleb knows how much we love him. This year Elijah wanted to use his Dairy Queen gift card to get a special treat for his brother’s birthday. He also wanted to send a sundae up with the balloon, but I had to break it to him that the balloon wouldn’t rise with a sundae attached. But it was a great idea! He also wanted to order an extra sundae and let it sit at the table with us. Another great idea, but sometimes I am very practical and didn’t want to waste the food. Maybe next year we can order a sundae and give it away to someone in line? And last night I opened Caleb’s memory box with the boys. The one that Josh and his grandpa made, that a friend of ours painted with extreme care and love. It’s beautiful. We sifted through trinkets and treasures, through cards and poems. We talked more about him. We talked about good memories I have of that time – of people gathering around us and walking through with us – the hands and feet of Jesus to us – God with us, just like He promises. Then we read a book about heaven and it was time for bed. I see how Caleb is changing our lives, our family, our world for the better – with the hope of heaven and the reminder of God’s love and faithfulness. I am proud of my son, honoured to be his mother, thankful, grateful for him. The saying It is better to have loved and lost than never to have loved at all comes to mind. I think it is true, but so hard to live through. I would much rather love and keep. So I love the two boys I have to raise, love them with all I am, with enough love for three boys all packed into two. And I keep going, always closer to the day I’ll meet our Caleb, knowing he would want me to live life to its FULLEST. Somehow I know him, I know he loves me, I know he’s waiting for me. Smile. That is good for my mother’s heart. Thank You Anna and Bless you and your family for sharing this Day with us. And blessings to you, Marlaine – I hope all is well with you! This post was the very first thing my eyes absorbed this morning. Your love for Caleb, and your determination to remember him, keep his presence constant, and to look forward with gladness to the day you see him again, moves me. I pray for continual healing and comfort from the ultimate Healer. Thank you, Cara, and blessings! We celebrated yesterday too, Anna. Your family here launched balloons with Forget-Me-Nots tied to them. We sang Happy Birthday and watched all the balloons float upwards, out of sight. In the gardens where Caleb would have played with his brothers and cousins. It’s hard to miss him but I constantly look ahead to the time I’ll see him and never have to let him go again. I pray that the flowers will plant themselves in fertile ground and that everyone who sees them growing every May wll somehow understand the recreation of our heavenly bodies, and my, how those Forget-Me-Nots spread and multiply their joy! I love you – you are a wonderful Gran. Hope to see you soon! So touched by your words..and i simply wanted to let you know that the balloon launch is something my family started when my mom passed away. We each write a small birthday wish for her and put it inside our individual balloons. We also sing happy birthday and slowly release our balloons and watch to see who can see theirs the longest. (i did laugh when i read that part in yours). This will be the 12th year of celebrating my mom’s birthday this way….and it’s something that has given each of us a chance to feel, to express and share in our love for my mom/their Nana. Know that what you have created will be treasured and continued and as your children grow older, they will appreciate this precious gift even more than they do now. sending you hugs…and love…lots of love. Laura – thank you so much for your words! It is so good to hear from you. What a trip down memory lane… I can’t believe it’s been 12 years for your mom, and 9 years for my Caleb. Time is a good healer. Our balloon launch is a tradition, and I love to see what’s added/changed every year as the boys grow. They are processing in their own ways.